Here’s a quick and easy way to get a delicious meal with bulk and creamy texture without planning something elaborate. For me it has the same effect as grilled cheese, only disassembled and without the empty calories and unnecessary carbs inherent in white bread. 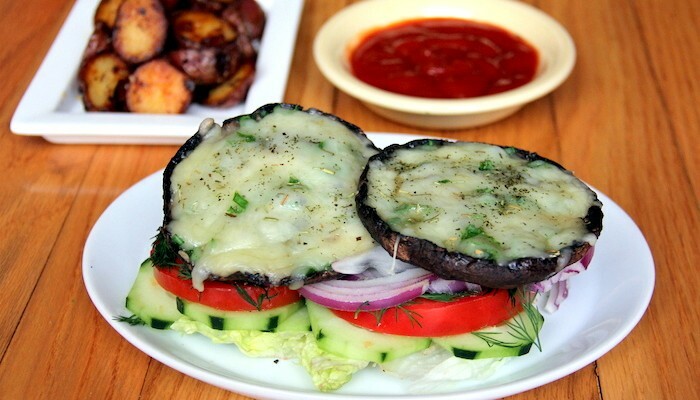 All it takes it cooking portobello mushrooms until tender, with a meaty bite and then adding goat cheddar cheese along with a few spices and add-ins. The result is an easy-to-digest but completely satisfying meal that brings more oomph to a salad or rounds off a main dish. Enjoy! Directions: Preheat the oven to 375 degrees Fahrenheit. Place the mushrooms, top-side down. Cook for 5, or until slightly tender and beginning to “sweat”. 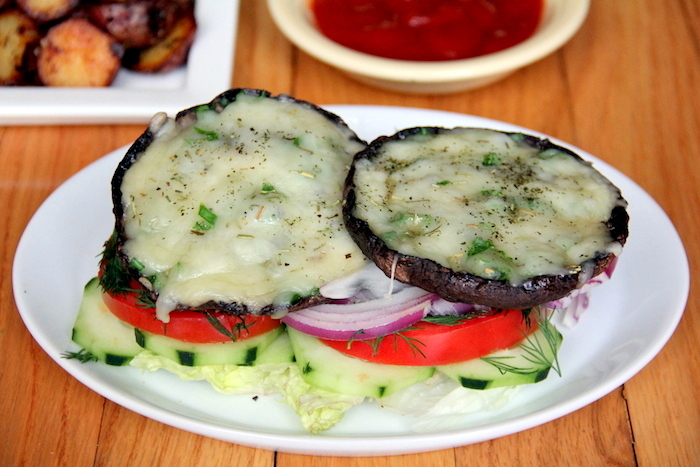 Remove from the oven and pat each mushroom with a paper towel to absorb some of the liquid. Rub the garlic and chives across the inside base of the mushrooms. Atop that, evenly distribute the grated cheese among the four mushrooms – 1 ounce per mushroom – and then season each with the thyme, rosemary, salt and pepper. 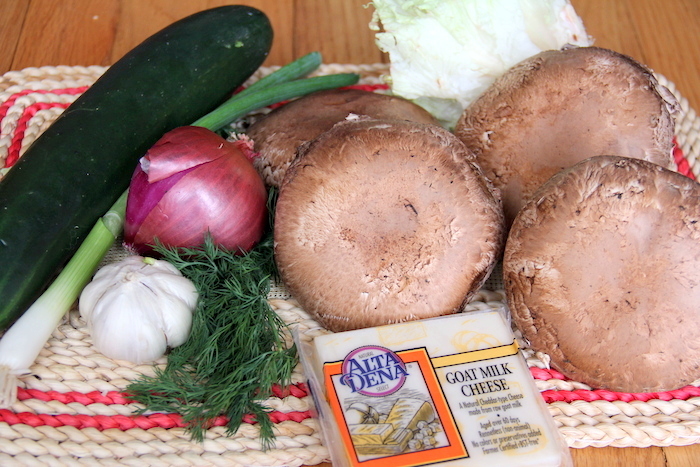 Place a 1/4 tablespoon smidgen of butter at the center top of each mushroom mound. Put the baking dish with the mushrooms back into the oven for 5-8 minutes, or until the cheese begins to melt. For the last minute, turn the broiler on to “high” and cook until the cheese browns slightly. 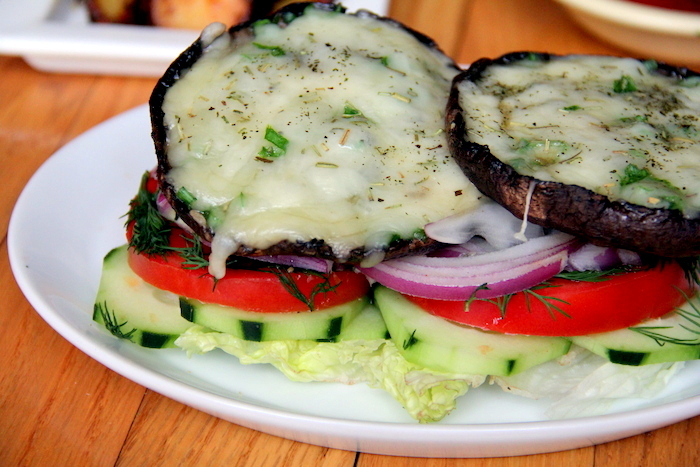 Serve with a garnish of fresh dill and with a salad or alone! 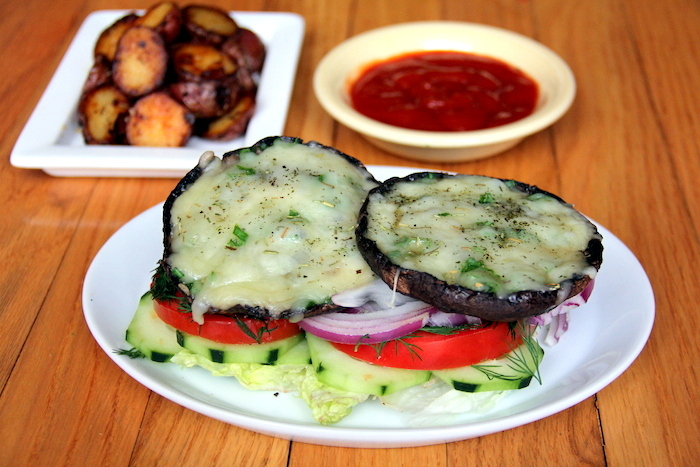 This entry was tagged cheese, detox recipes, easy healthy recipes, edible mushrooms, good vegetarian recipes, great vegetarian recipes, healthy, healthy dinner recipes, healthy food recipes, healthy recipes, heart healthy recipes, how to become a vegetarian, mushrooms, portobello, quick vegetarian recipes, salad, sandwich, sandwich ideas, sandwiches, simple vegetarian recipes, vegetarian, veggie recipes. Bookmark the permalink.